The first annual OAS Christmas show was held in 1966 at the Cottage. Tickets were .40 cents or 3 for $1.00. The event has steadily grown throughout the years. 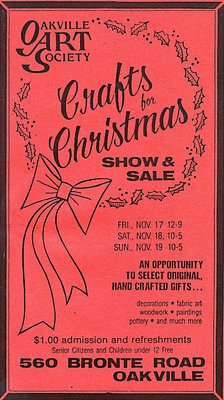 In 1972 it was reported that 12,000 people attended the Christmas Show (known then as Crafts for Christmas). The proceeds raised from these shows go towards funding classes and the general function of the Society. The first Art Auction was held at the Chamber of Commerce Quarters on April 29, 1966. Like the Christmas Show, the proceeds of this event typically went to support general operations at OAS. 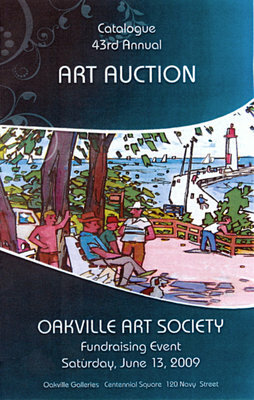 However in 1986 all proceeds from the auction were donated to the Oakville-Trafalgar Memorial Hospital Building Fund Campaign. 1987 was a special year for the auction as it was broadcast on cable 10. The 3.5 hour auction was held in an effort to help pay down the mortgage on 560 Bronte Road. More then just original artwork, items like televisions, a diamond ring, stereo system, model train set were donated by local businesses to help with the cause. Today the event is held at the Oakville Centennial Galleries and artist participation is by invitation only. 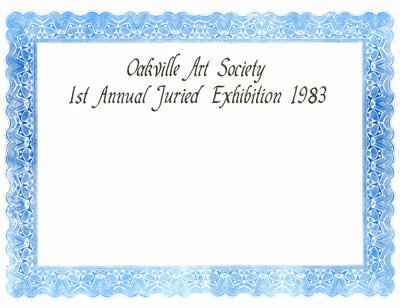 In 1983 OAS held its first juried event at Bronte Rd. 217 entries were submitted and 77 were selected for the show. In 1985, rules changed slightly which only allowed members to participate. Recently the juried show has been held in Town Hall. Awards are given out in two categories 2-d work and 3-d work. A Student Show is held at OAS every spring. The show is open to all OAS students and awards are given out for people's choice.